***While the General Assembly is in session no contributions can be accepted. Call Rick if you have any questions. Thank you for contributing to our campaign. I hope you know I’m pretty tight with a dollar, too; and I will use your contribution to its fullest. 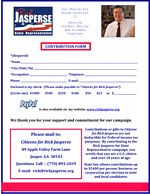 All money raised will be spent on yard signs, advertising, and other campaign materials and expenses. You can use the Contribution Form below to mail your check to us, or you can securely donate online using PayPal (Visa, MC, AmEx, Discover). State law allows contributions up to $2,400 per person, business, or corporation per election to state and local candidates. This means that a husband and wife can give up to $4,800; however, they must sign separate $2,400 checks to do so. A person who owns a corporation may give the maximum personally and the maximum from their business or corporation, but the contributions must be made with separate checks. State law requires the disclosure of the name, address, occupation and employer of all individuals, businesses, or corporations whose aggregate contribution exceeds $100. While contributions can come from individuals, businesses or corporations, they are not tax deductible.